A favorite hike on the California Central Coast is the Skyline to the Sea Trail, a 29 mile trail stretching from the crest of the Santa Cruz mountains, through Big Basin State Park Headquarters above Boulder Creek and terminating at Waddell Beach 20 miles north of Santa Cruz. We decided to make a day hike of the lower half – a 12 mile walk from the Big Basin Park Headquarters to Rancho Del Oso at Waddell Beach on State Highway One. 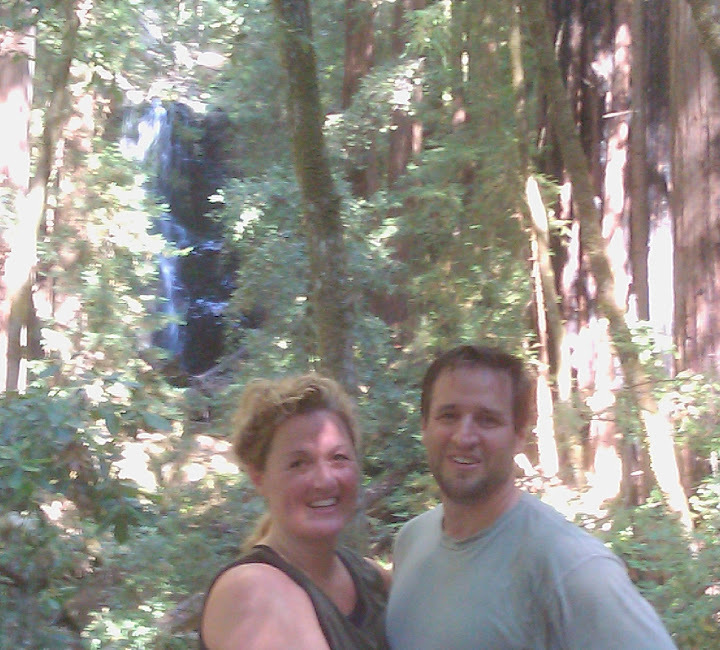 We hiked the trail on September 6, 2010. There are a lot of write ups about how beautiful the hike is — and it is! However, we had a hard time finding good write ups of the logistics so I’ll share some of our experiences here. 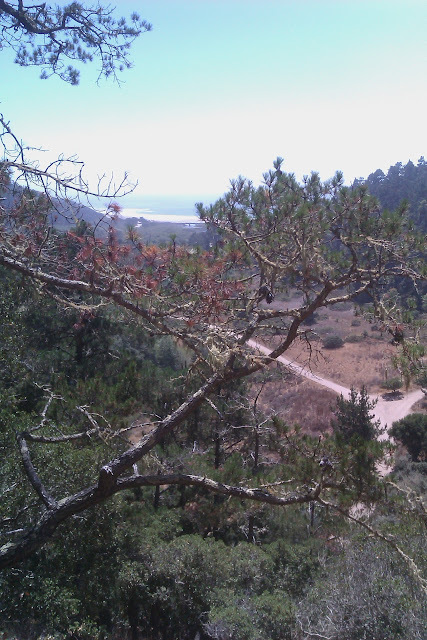 The path from Big Basin to Waddell Beach is approximately 12 miles and crosses a few ridges at the start. After the first four miles, it is mostly a gentle downhill. We hiked in Fall, but unless it’s storming, the hike should be doable year round for sure footed hikers. Some write ups of the hike say it takes eight hours. Many suggest seven hours. Some suggest five to six hours. We are fairly fit and walk just a bit faster than a stroll. It took us just over five hours from start to finish which included two 20 minute breaks. This is important to know if you are planning transportation from the end of the trail, since there is little to no cell phone coverage on the trail or at Waddell Beach. We started at 9AM and found the entire hike to be a comfortable temperature in September. I wore shorts and a short sleeve tee shirt. I packed a light windbreaker jacket in case the weather turned cool. Much of the first half is under redwoods, which keeps things cool. The middle portion winds along Waddell Creek. The last few miles can get the ocean breeze from Waddell Beach in the Summer, so it’d be hard to get too hot on this walk unless the high temperature forecast for the area is past 90 degrees. We brought sunscreen, but didn’t need it until we arrived at Waddell Beach. We packed two 32oz bottles of water each. For a 75 degree day, we were surprised that neither of us consumed more than a single bottle. We packed large lunches — perhaps enough for two meals per person. It’s wise to carry enough food, water, and clothing to last overnight on a hike like this. Since this is usually a one way hike, some transportation arrangements are necessary. Cell coverage is spotty or non existent for the majority of the trail, so don’t count on being able to call for a ride while hiking or at Waddell Beach. 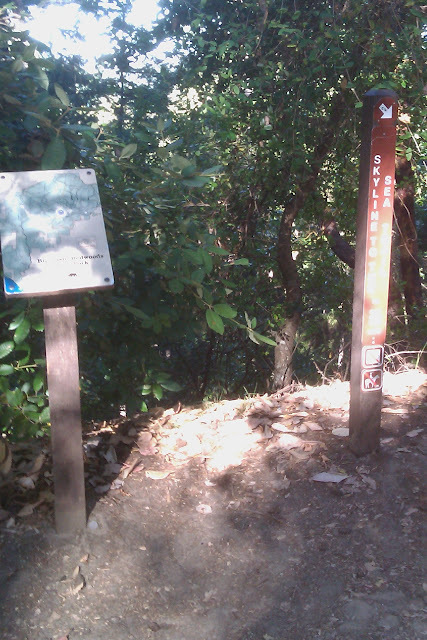 There is a pay phone at the end of the trail near the Rancho Del Oso Ranger Station. We hiked on Labor Day, so the busses were not running. Day parking is currently free at Waddell Beach, so a car could be left there during the hike. We opted to arrange for a ride from the Beach. Parking at the Big Basin State Park Headquarters was plentiful on Labor Day morning. The cost was $10 to park until 10PM. Maps are $5. The trail entrance isn’t very clear from the signs or the map. 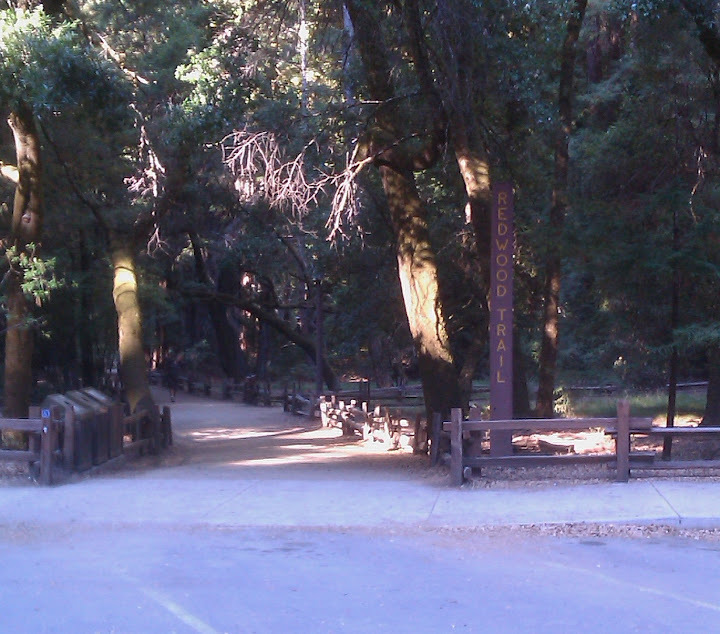 We entered the trail system through the Redwood Trail entrance. 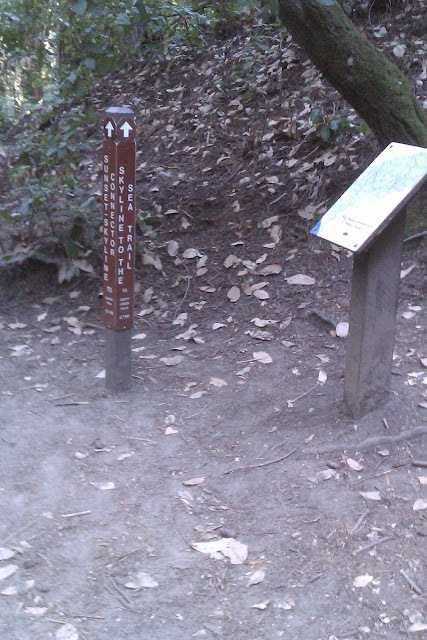 You could do the hike without a map as long as the sign posts are in place. We recommend a map just in case some posts are missing. We bought one from the Ranger Station for $5. 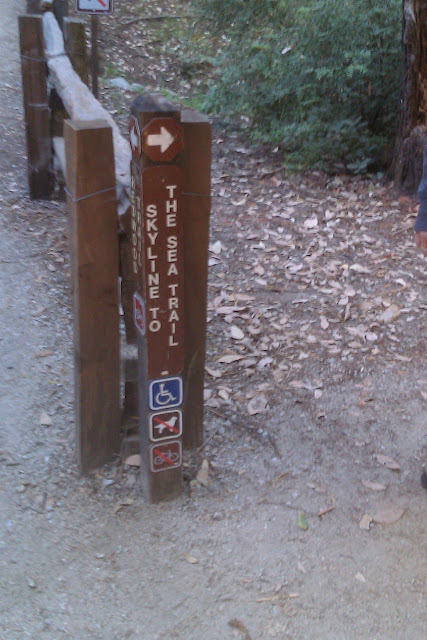 The official Start of the Skyline to the Sea Trail (As found from Redwood Trail) from Big Basin Park Headquarters. 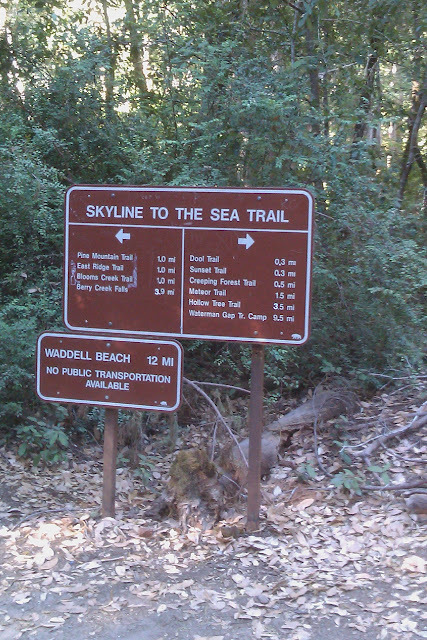 The map suggests that Sunset Skyline is a slightly shorter route that connects with Skylkine trail several miles on. We opted to stay on the Skyline trail. 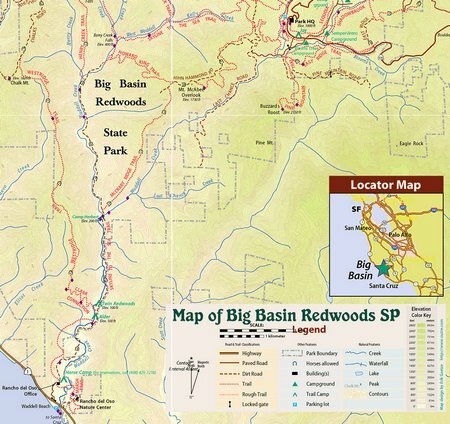 Remember that Big Basin Headquarters is roughly a halfway point. Turn right to head uphill to the Skyline. Turn left to head to the Ocean. After a mile of some ridge climbs on a single track trail, we crossed Middle Ridge Fire Road. The trail to Waddell beach heads downhill here. The trail is mostly a single track and is mostly down hill with occasional short ridges. About 40 minutes in we come up to a checkpoint. This is the connector to the Sunset Skyline trail. At 10:53 AM, almost two hours in, we arrived at Berry Creek Falls. You can see the falls from the Skyline trail, but the viewing platform is only 1/10th of a mile detour from the Skyline Trail. We crossed a fallen tree bridge for a shortcut and spent about 20 minutes enjoying the falls. 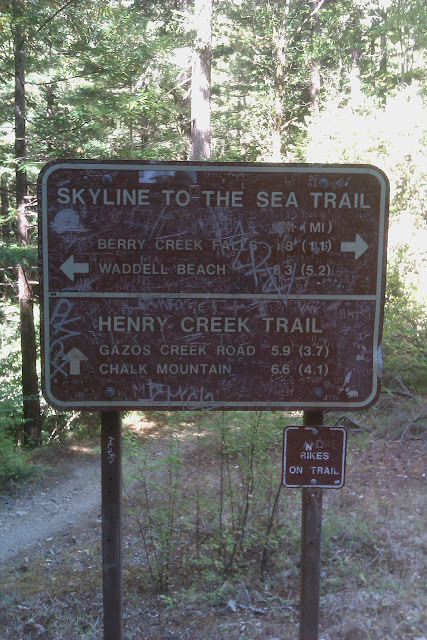 Leaving Berry Creek Falls, there are some choices, but the signs are clear. 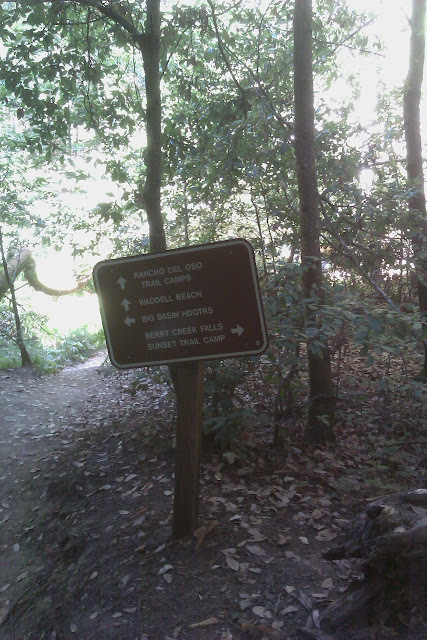 After Berry Creek Falls, the trail widens into a road-like trail. A few more uphill climbs, cross a creek and you’ll see a bike lock up area where Mountain bikers coming from the Beach and lower trail camps are supposed to stop and lock up the bikes. The next five miles are mostly on a wide dirt path with plenty of room for horses (we saw lots of signs of horses) and families riding mountain bikes. A few miles after crossing Henry Creek Trail, we stopped and ate lunch, resting for about 20 minutes. There are many scenic places to enjoy a mid hike break since the trail closely follows Waddell Creek. 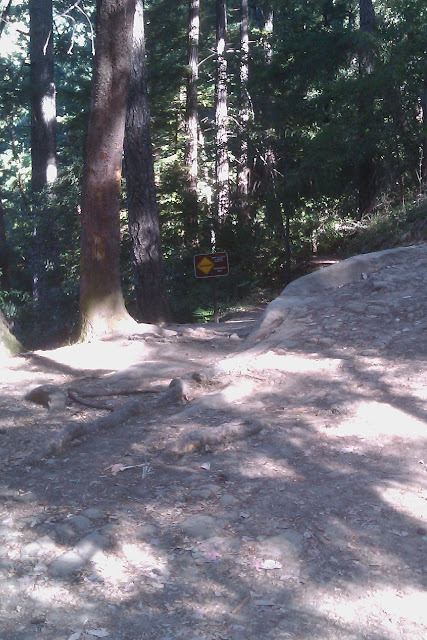 At the lower trail camp (roughly mile 10) , a sign urges foot hikers to take a single track up over the Northern ridge of the valley that opens up to Waddell Creek Beach. This involves some climbing again — right when we thought we were in for a easy downhill to the beach. 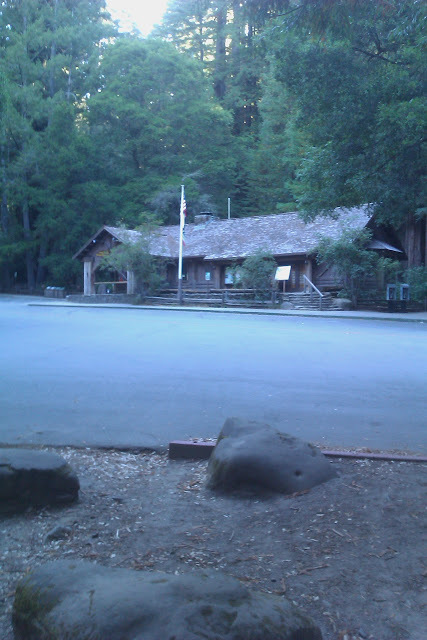 From this view, it’s about an other 20 minutes to the Rancho Del Oso ranger station. 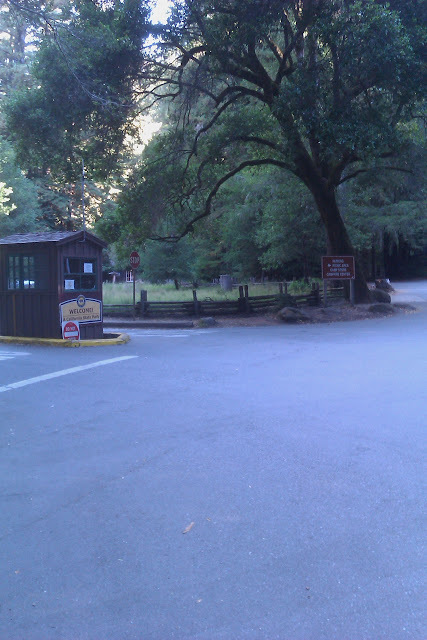 There is a pay phone at the Rancho Del Oso ranger station. When our calling card didn’t work, we asked the ranger for change for a dollar. She kindly offered to call our ride. It’s less than a mile from the ranger station to the beach where there’s a bus stop on the West side of the highway. Our total time to the beach was Five hours and fifteen minutes which included two 20 minute breaks and about 10 minutes chatting with the ranger. We rested on Waddell beach and watched the kite surfers while waiting for our ride. We’re certainly planning to do the hike again, and to invite our friends. I have tried to contact you through this website. I am John Malmin and I believe we are related. I basically have the same family tree as you show on your blog here and thought it might be neat to connect. Thanks for the info. Did the hike years ago with youth group and have always wanted to take my kids on it. I think its a plan for this August. Hi Karen! Thank you for the helpful info! My family and some church friends are planning to do this hike from the Ranger Station in September. We are renting a 15 passenger van, leaving it at Waddell Creek, and transporting everyone back to Big Basin. I can’t wait! I am hoping that for the time being, we will have to substitute this hike with the Pacific to Redwoods Loop at Wilder State Park, and hope it is close enough in awesomeness. Thank you for your inspiration! @Brittan Thanks for the update on the bus system. Looks like it’s time to get a group together an leave a minivan down at Waddell. 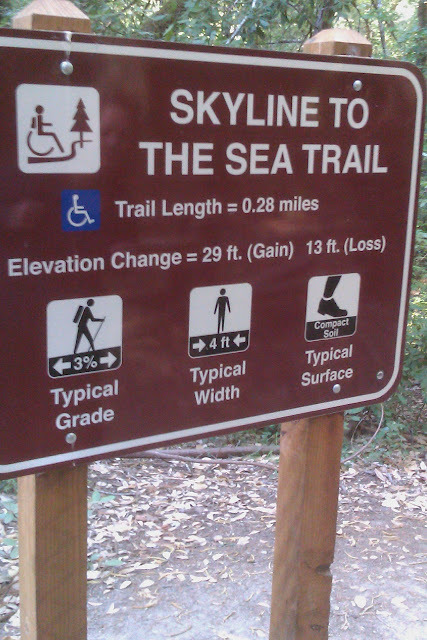 Thanks for the info it helped me with my hike. And yes the buses don’t run to the beach anymore. The bus service stopped two days before i did my hike lol. Ah, well still had a good time. @Chris – Glad you made it home! 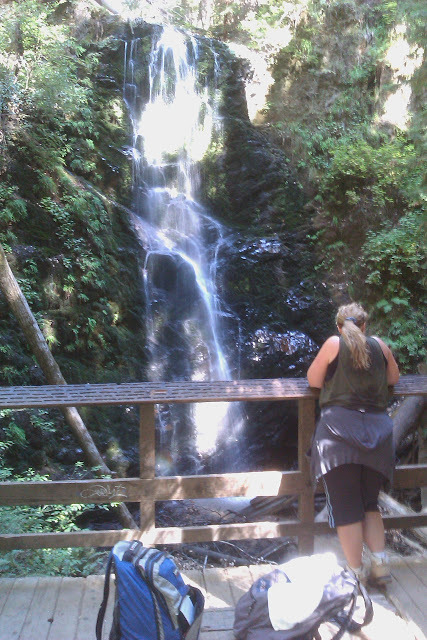 All: Karen and I and a group are planning to hike the trail again October 29 (2011) at 9AM. Hope to see more folks out there. Has any one tried hiking the the beach and back in one day? If so how long did it take you? Thank you for putting this out there. It was very helpful, about to hit the trail and even a few years after the info here is great. Thank you very much for posting all of this detailed information! I am going to pick up my son today at Waddell Beach after he and some guys from his boy scout troop hiked Saratoga to the Sea these past 4 days. Your pictures and descriptions were fun to see and get an idea of what he saw. My boyfriend and I did your hike, but round trip. We started at Waddell Beach, hiked up the horse trail to Headquarters, and then followed your trail back to the beach. Insane, yes I know. I have been getting wildly different distances from headquarters to the beach. How did you calculate 12 miles? I have gotten from 9.5 – 13. So what is the best way to do this? 2 people 2 cars? Go to beach 1st, drop off a car, go to park, hike down to beach, hop in car, then get other car?